Today is Sunday, so it is time for me to review the new Code film which I watched this week. This is #5 in our weekly series 52 Code Films. It is the first article in the series which we are publishing in February. I have been enjoying my discovery of films from the Breen Era which I have not seen before. I started this series because I wanted to commit to watching many new films this year. There are so many great American films from the Breen Era alone that it is probably impossible for anyone to watch all of them. However, we can try to watch as many as we can! On Thursday, the last day of January, I watched two new Code films, the only two I watched this week. They both were excellent films which I would enjoy reviewing. However, my usual practice is to eliminate a potentially difficult choice of which film to review by writing about the first new movie I watch in the week. 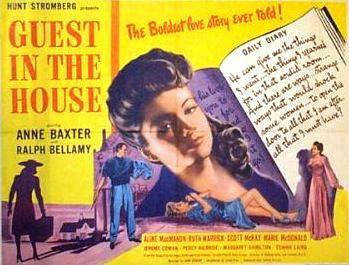 Thus, I will write about the first of the two movies, Guest in the House from 1944. 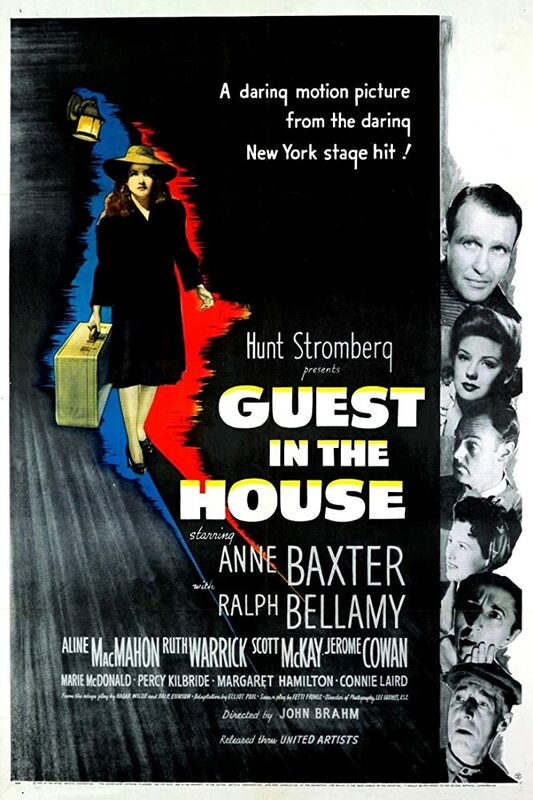 This Hunt Stromberg production stars Anne Baxter, Ralph Bellamy, and Aline MacMahon. This movie was included for free with our Prime membership on Amazon Video. Click the link below to become a Prime member yourself; you will be supporting PEPS through Amazon’s Affiliate program while acquiring free two-day shipping and hundreds of free classic films for yourself! A young doctor brings his fiancée to his brother’s house to continue recovering from her heart disorder. Her father is a drunkard, and she has had a difficult life, but the generous young man wants to cure her and then marry her. The pretty young woman seems sweet, but there is something a little odd about her. Neither the brother, his wife, their daughter, his aunt, nor their two servants seems to think that there is anything wrong with their house guest which kindness and patience won’t cure. However, a friend of the family sees through her act immediately. 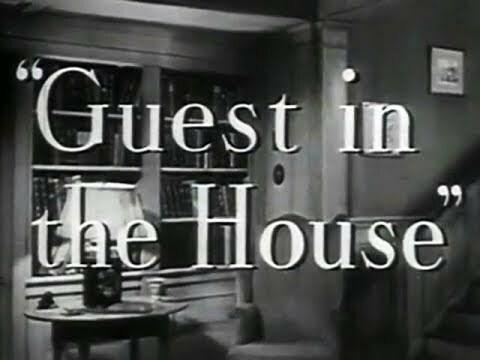 The first night, the guest has a fit when the kindhearted daughter offers her her pet bird, since the young woman has an irrational, extreme fear of birds. The brother, who is an artist, draws a sketch of the young woman as she will look when she is well on the lampshade. He is just being kind, but it is clear that the patient is attracted to him. When we hear the young woman read the dreadful, manipulative things she has written in her diary, we realize how disturbed and wicked she is. She doesn’t care about her fiancee at all, but his brother is the man she wants. The brother designs a dressing gown for her, and his aunt sews it by the next morning. The next day, she receives the gift of the dressing gown, which makes her think he really cares about her. She convinces her fiance to take a job at a hospital for a few months so that she can be completely recovered when he returns. He agrees, not knowing that she is just trying to get rid of him. With the doctor out of the way, the diabolical woman begins her plot to take over the household. She starts by planting suspicion about the beautiful model who lives in the house and who poses for the artist. Soon, that suspicion spreads throughout the family, getting rid of the rival and creating a rift between husband and wife. The manipulative woman is now the model, but the role she is ultimately trying to steal is the wife’s. Meanwhile, the daughter is turning neurotic as she imitates her. No one in the family knows what is causing their once-happy household to turn against itself. Can they discover their guest’s true nature and sinister plot before she destroys them all? The manipulative guest is Evelyn Heath, played by Anne Baxter. Her fiancé is Dr. Dan Proctor, played by Scott McKay. His brother is Douglas Proctor, played by Ralph Bellamy. Douglas’s wife is Ann Proctor, played by Ruth Warrick. Their daughter is Lee Proctor, played by Connie Laird. His aunt is Aunt Martha, played by Aline MacMahon. Douglas’s model is Miriam, played by Marie McDonald. The friend of the family is Mr. Hackett, played by Jerome Cowan. The maid is Hilda, played by Margaret Hamilton. The butler is John, played by Percy Kilbride. This film was directed by John Brahm. It was produced by Hunt Stromberg. It was made by Hunt Stromberg Productions and released by United Artists. The screenplay was by Ketti Frings. It came from a play by Hagar Wilde and Dale Eunson, which was adapted from a story by Katherine Albert. It was nominated for an Academy Award for Best Music, Scoring of a Dramatic or Comedy Picture, which was written by Werner Janssen. This is a good Code film. It deals with many serious matters in a careful and acceptable way. There are no objectionable qualities in this film. It is an example of good Code entertainment. This is a suspenseful drama. Some classify it as a film noir, but it seems that its status as such is a debated point. At any rate, it has some very dark elements. The character of Evelyn is particularly sinister. However, the triumph of good over evil is definitely felt. The darkness of the story could easily have spread to very inappropriate and unacceptable content if it had not been self-regulated properly. As it is, this film has a restraint and a cleanness which makes it even more powerful. There is also a strong message in this film. It is a cautionary tale about being wary of those we let into our lives. Itt does not encourage audiences to be unduly suspicious of everyone, but it does tell us to open our eyes and to see things as they really are. This story could be viewed as a parody of what lawless, un-Code entertainment can do to us. Like Evelyn, it comes into our homes, so sweet, gentle, and grateful for having been invited. It appreciates the time and attention we give it, giving only warmth in return. Eventually, problems begin arising within our lives. The problems begin in obscure ways, but they quickly start to poison our lives. Our friendly guest is concerned and dismayed by these problems, seeming so innocent. It even offers help to resolve the problems and comfort when they cannot be resolved. We never guess that the trouble was actually caused by the kind, innocent guest. How could any trouble be caused by someone so gentle and inoffensive? It takes someone to call our attention to when our trouble began, such as Mr. Hackett in this film, to make us realize when and how our problems started. Only then can we identify the villain and evict it. Like Evelyn, evil entertainment must be seen as the enemy and thrown out of our society and out of our lives before it destroys them completely. This is a very entertaining film. I found it absolutely captivating. The acting is excellent. Throughout the film, I marveled at how horrible Evelyn was, at the same time commending Anne Baxter’s powerful performance. She exquisitely switched between the dual sides of her character, one minute being sweet and helpless and the next being jealously conniving and ruthless. It is infuriating to see how blind the other characters are to her wickedness, but I think it is very realistic. We are often unable to see how nefarious people near us are. The cinematography is very effective. The use of shadows and lighting in the black and white film is very dramatic and chilling. The score adds to the suspense of the movie. The first few minutes of the film were difficult to follow, but the characters unfolded beautifully as the movie progressed. This movie had an eerie, chilling quality which lingered with me several days after I watched it and still remains when I think about it. 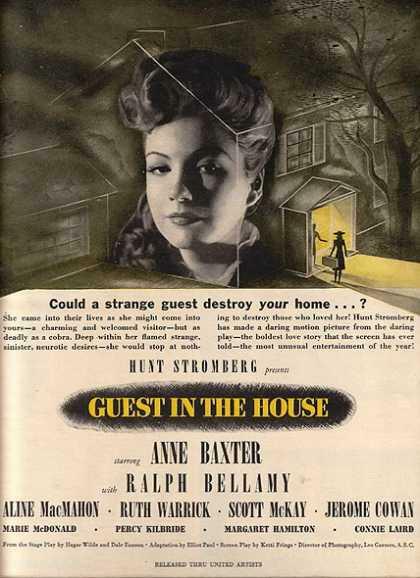 I highly recommend Guest in the House to those who enjoy classic mysteries and suspense films. It will be particularly enjoyable and entertaining to those who enjoy psychological films. It is a classic idea to center a story around a manipulative woman who uses and abuses those around her, particularly men. This film uses that angle very well. I think that film noir fans would enjoy this picture, even if all wouldn’t consider it to actually be a film noir. There is no violence in this movie, nor does anything really scary happen in it. It is certainly not a horror film. However, the realistic depiction of such a disturbed and odious woman is quite horrifying and undeniably creepy. It could be described as a gothic story. Those who enjoy mental thrills and chills will appreciate this film. I have realized that I did not watch the original, unedited film. I watched a 100-minute version, while the original was 121 minutes. It seems that a prologue which made the film a flashback was omitted. I can’t give my opinion on those additional minutes. I like what I saw, so I’m sure I would like that part, too. At any rate, this is a very enjoyable and unique picture with a great cast and a spine-tingling but entirely Code-compliant story. Click the above image to buy this movie on DVD at Amazon and support PEPS through the Amazon Affiliate program! The image on the left is the 121-minute version, and the image on the right is the 100-minute version, which I saw. This week, I watched one extra new Code film, Once Upon a Honeymoon from 1942, which I will review some other time.